Dead set I cannot believe that we are at this time of the year already. Promises of catching up before Christmas are starting, Melbourne cup around the corner and LOTS of drinks and social gatherings before Christmas which is fast approaching. GULP. We have lots of various catch ups during this time: School families, friends from Sydney, local friends from home and of course LOTS of family functions. Sometimes it’s dinner, mostly lunch and if I have anything to do with it a quick drinks situation with nibbles for a fuss free option that I am looking for this year with a young baby. 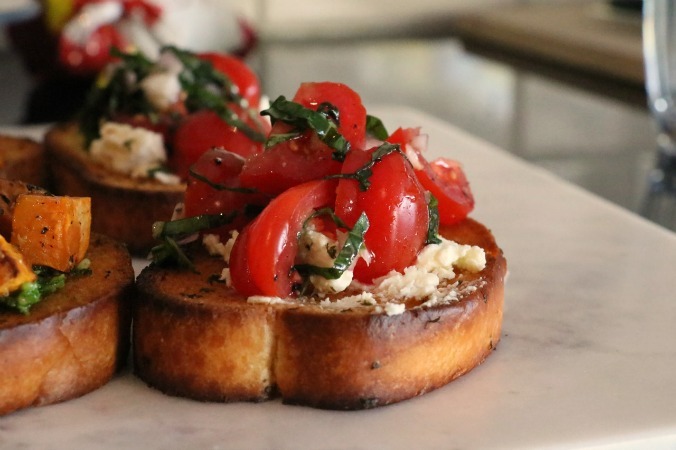 I’ve got some great cheat ideas here for you using La Famiglia garlic bread and some easy recipes for bruschetta that you can whip up in under 20 minutes. 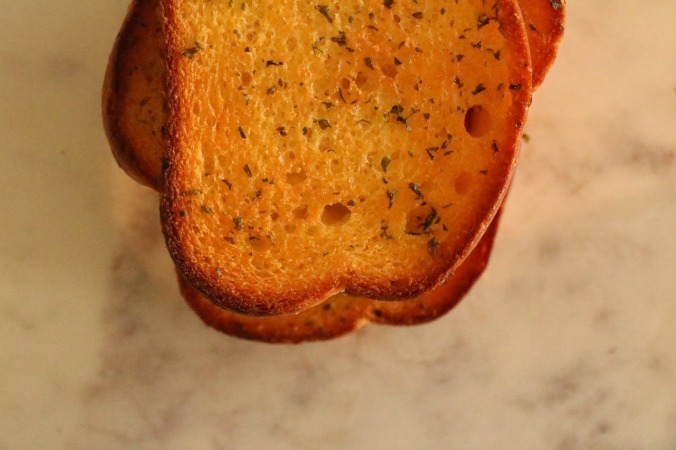 I’ll always try and use as many shortcuts as I can this time of year…adding some freshly made toppings no one will know that you’ve skipped a step using this garlic bread from your fridge. 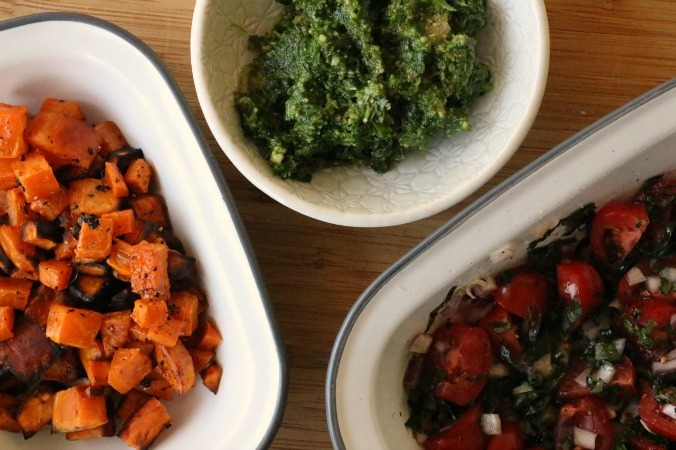 You can have an impromptu party back at your place and have something tasty to eat in no time. Or am I the only idiot that seems to do that?! 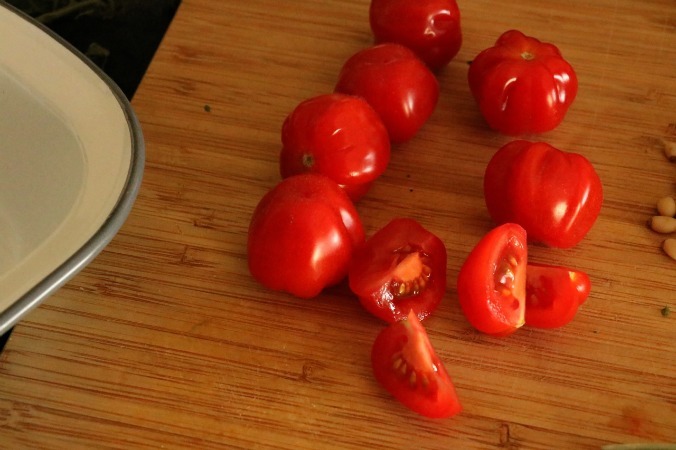 These two toppings can be made ahead of time and kept in the fridge, as well as being used in combination with each other. They are packed full of flavour and are perfect as a more substantial nibble with drinks or even as a simple dinner or lunch starter. 2. 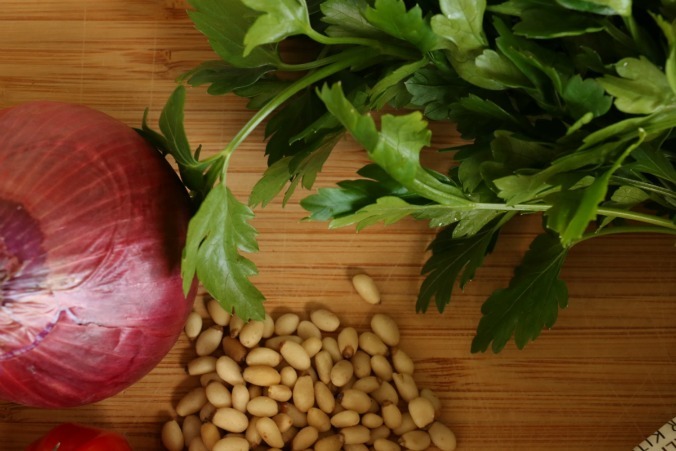 Whip the parsley, garlic cloves, parmesan, pine nuts and salt and pepper into a food processor and gradually add in the olive oil. 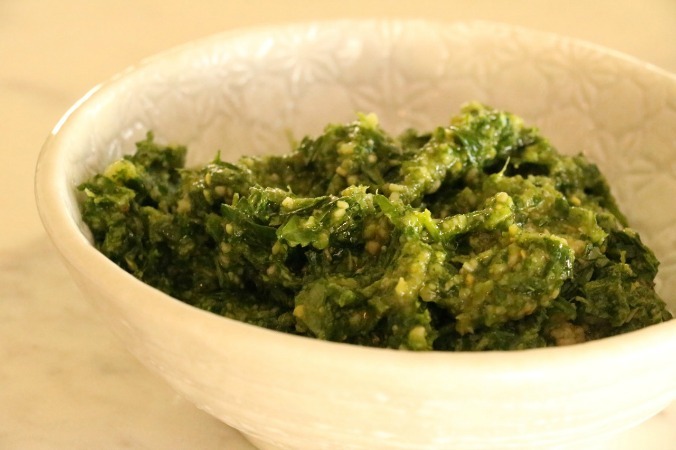 You can see my recipe for pesto here. 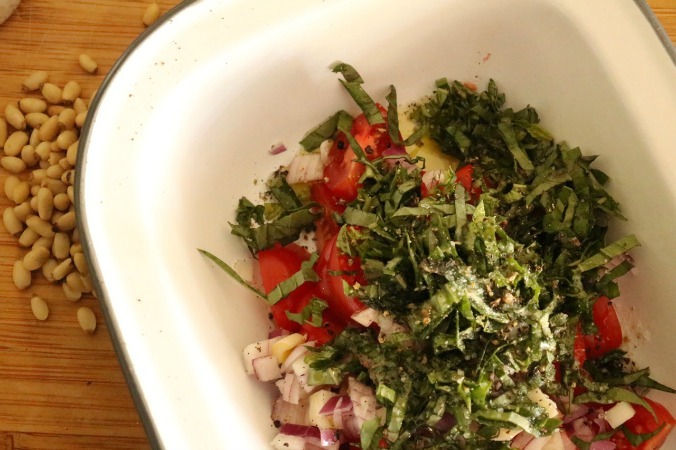 You can use basil or parsley. 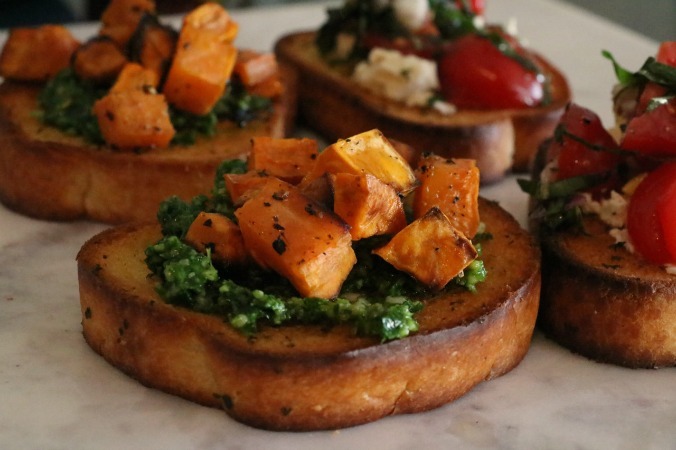 Mix and match the toppings too – add some pesto with the tomato mix, the fetta with the roasted sweet potato and of course some cold champagne with them both! 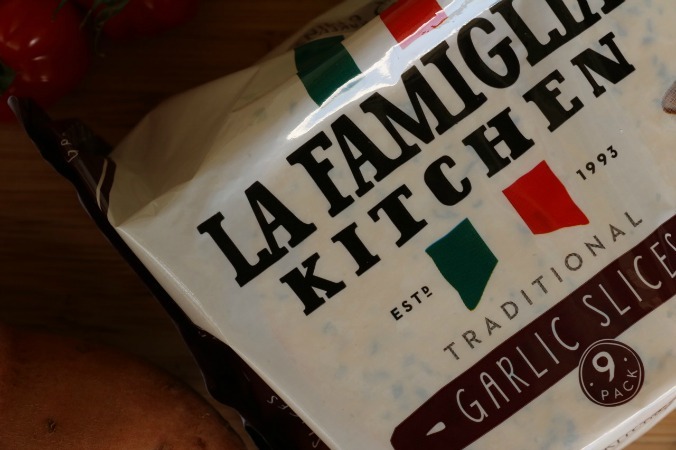 Thanks to La Famiglia we are giving away a year’s supply of garlic bread! Just leave a comment below telling me how you take your family meals from simple to special. You can read the T&C’s here. For a chance to win tell me how you take your family meals from simple to special and enjoy these two simple ideas this busy social season! oh my! … thanks beth! I wonder who’s been to Italy recently! simple and fresh! just gorgeous food! … yum! KISSweetheart! a good way to go! La Famiglia garlic bread makes every meal special. 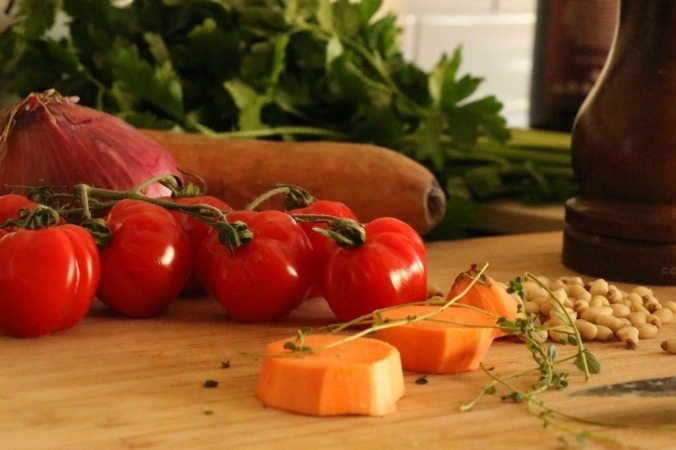 From the good old Lazagne, soups, to panzella salad or on its own. 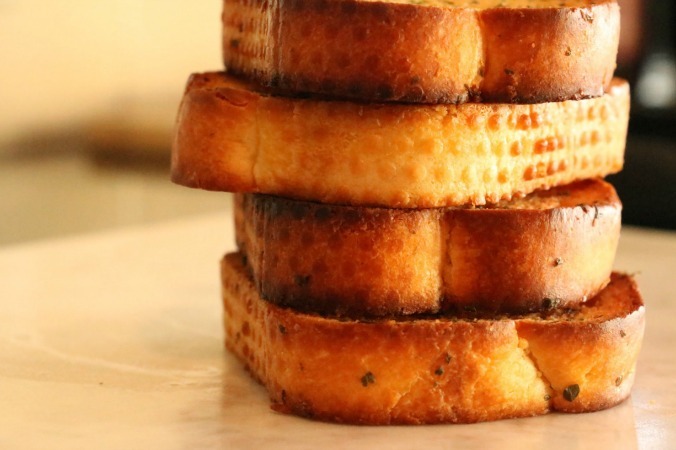 It hits the spot for my bread addiction, with the added flavour hit of butter and garlic. You can’t go wrong! 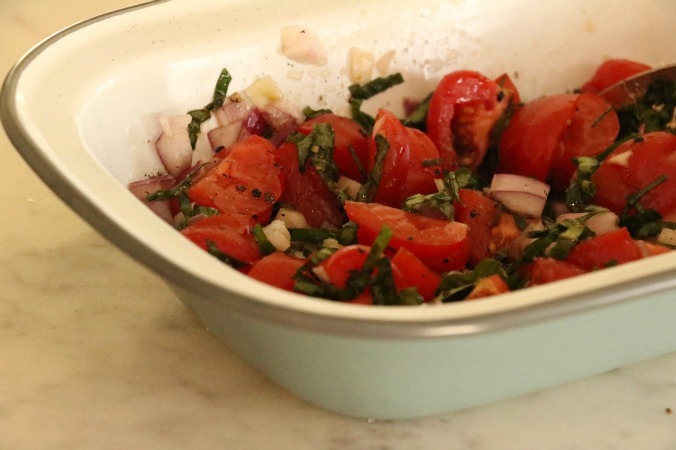 I must try your bruschetta recipes! Fresh herbs from the garden always help to bring something from simple to special. As well as the setting. A clean table, nice music, maybe some candles (my toddler loooooooves candles) and having a good old laugh. Winning combo for a memorable meal. 🙂 Your bruschetta looks super delicious Beth!! 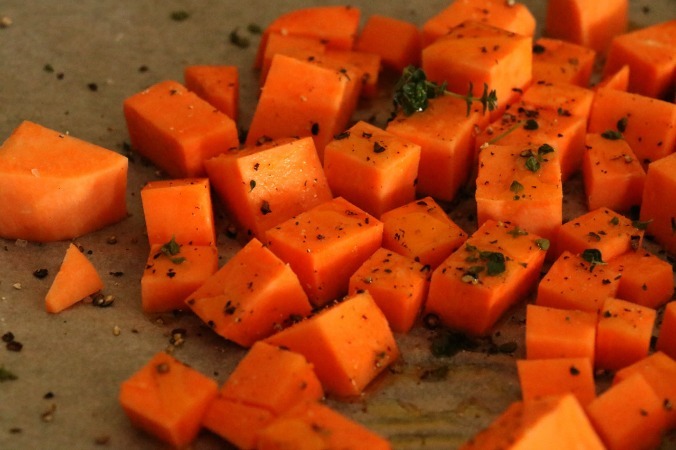 Yum – I’m going to add the sweet potato and pesto into my recipe book. 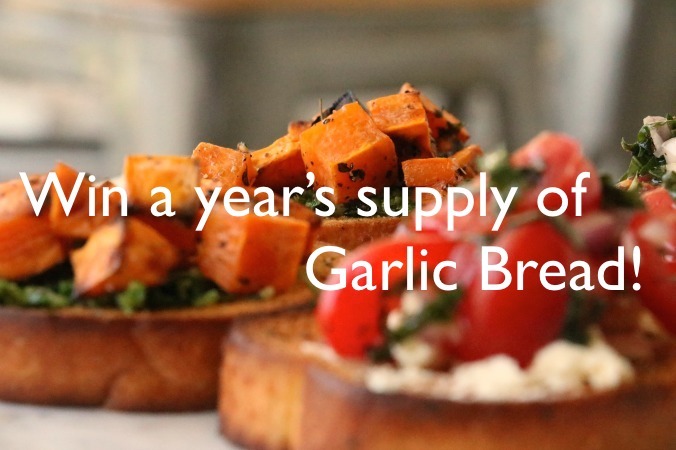 Who wouldn’t want to win a year’s supply of garlic bread? My best tip for simple to special is have good wine flowing. Then no one notices as much how lack lustre my cooking is. 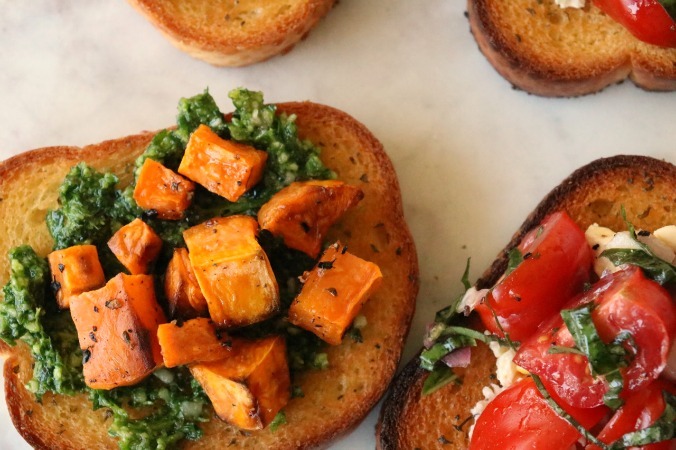 That bruschetta looks amazing! A super trick my Mum taught me is that a family meal is always more special when the food is generously heaped on big rectangular white platters and put in the middle of the table. It looks stunning no matter what the dish and everyone helps themselves! And it also keeps family sitting around the table longer spending more precious time together. Hi Michelle! Congrats! You are the winner of the Garlic Bread supply for a year! Can you please shoot me an email ([email protected]) with your full contact details so I can get it organised for you? Thanks and congrats! Wow this is amazing Beth! Thank you so much. This will be perfect with the entertaining season coming up. I’ve sent you an email with all my details. You’re so welcome – thanks for your entry and enjoy! Seriously THE best family meals are the simple ones….they allow you to spend more time with the family and stress less. 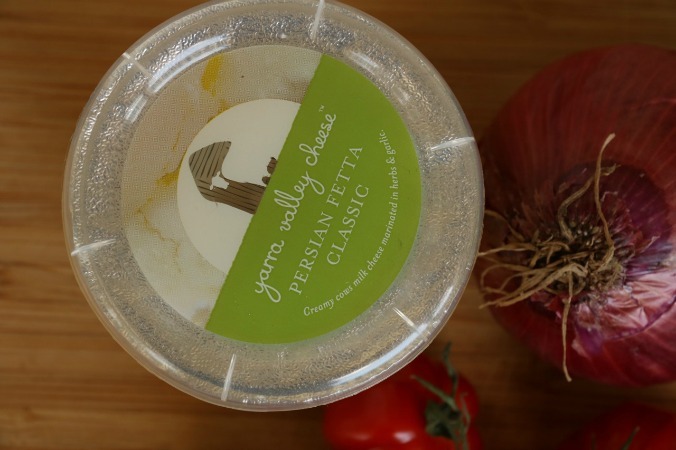 My secrets are fresh, local, seasonal ingredients…saving money and supporting local farmers. Cheeses and a variety of balsamic and also kitchen staples that can turn the simple into delicious. Woohoo to heavenly garlic bread! I really, really don’t need to win a year’s supply of La Famiglia garlic bread but I really, really want to win so I can try out all Beth’s recipes!! Flynn keeps insisting we add La Famiglia to the shopping trolley each time we shop after sampling the leftovers you created! Their screams are heard for miles – “gourmet noodles mum woohoo! Simple to special.. for me is all about the presentation. A fancy wooden serving board and a jug of flowers always makes my simplest offerings seem magazine cover worthy! 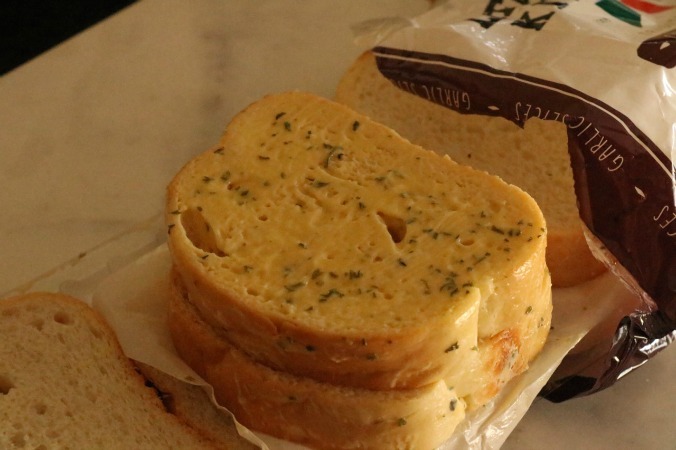 My family LOVES this garlic bread. Loves it! So being the good wife that I am i trotted off to buy some more and give these recipes a work out. Demolished faster than I could make it! 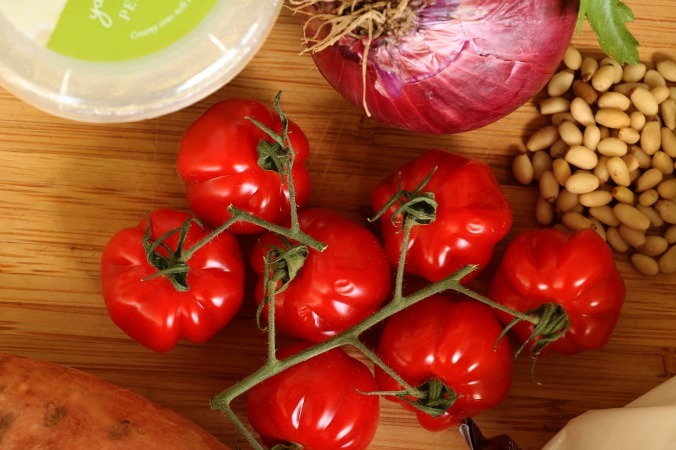 Family meals go from simple to special when you throw lots of fresh ingredients together with some pantry/ fridge staples. And bubbles they make the simplest meals special! 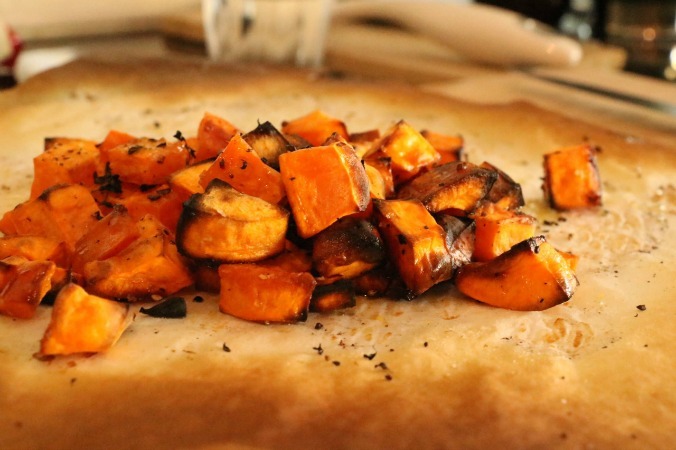 Thanks Beth, this recipe will be on high rotation in the lead up to Xmas. I’ve recently discovered a couple of delish dip recipes and fully intend to roll them out for family gatherings and the odd family dinner. They even pep up the old ham and cheese toastie! Dip is one of those things where the store bought are fine and tasty, but homemade can take it to the next level! I am hopeless and never make dip – well the chilli tuna one is it!